Sunshine, thick-white clouds and a goodly breeze. The Little River Beach was superb this morning when I finally took Cowboy and Kuru for their walk — good time had by all. “I think the attorney general just stonewalled us. He shared with us what he wanted to share with us. 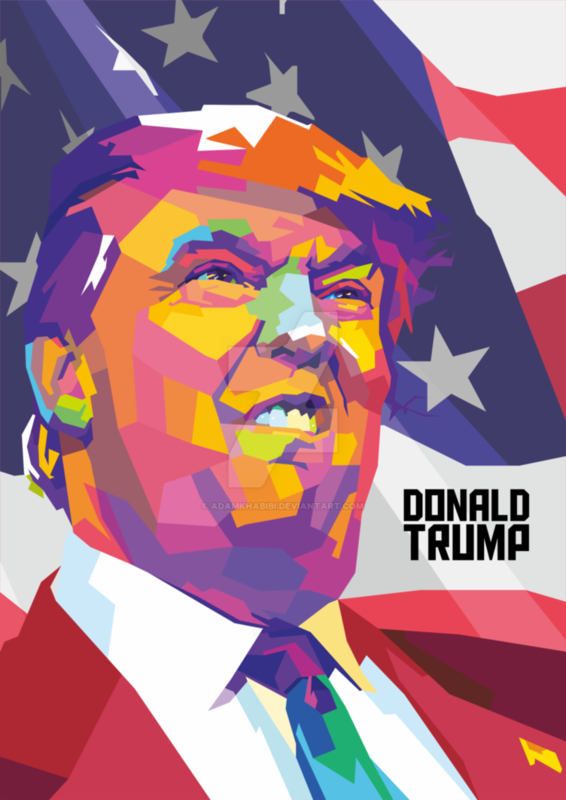 (Illustration: ‘Donald Trump,’ by Adam Khabibi, found here). “I don’t intend at this stage to send the full unredacted report to the [judiciary] committee,” Barr said. He also said that he would not seek a court order to release grand jury information despite demands by judiciary chairman Rep. Jerry Nadler (D-NY) for such information to be provided. Lowey asked Barr if he had consulted with the White House before releasing his summary. Barr declined to answer. “I’ve said what I’m going to say about the report today,” he said, adding that he was prepared to testify in front of Congress about the report in May. Rep. Charlie Crist (D-FL) asked Barr if he let anyone outside of the Department of Justice read his March 24 letter to Congress summarizing Mueller’s work. “The answer, I am pretty sure, is no,” Barr said. “You’re not sure?” Crist asked. “I am sure,” Barr said. Later, Barr clarified that before the letter went out to Congress, the attorney general’s office told the White House counsel that the summary was sent out. “I think it may have been read to them,” Barr said, adding that he did not think that the White House actually saw the letter or that saying he doesn’t believe they saw the letter and didn’t get chance to change it. Words corkscrew-like of idiot guilt. As seen, there’s more to the T-Rump than just the T-Rump. However beyond my comprehension is how/why anyone could work and/or do the business for someone like the T-Rump, really one of the most-vile and repugnant individuals in the entire history of Americana — way-most-likely there’s a shitload of people worse than the T-Rump, lurking about in our local neighborhoods, but he’s POTUS. And the committee hearing shows Barr’s a longtime stonewall liar, too, just like the T-Rump, one of the most brazenly-ignorant liars ever. But it wasn’t just on the Mueller report where Barr made astounding admissions. Democratic Rep. Brenda Lawrence came after Barr on whether the DOJ’s about-face attack on Obamacare was done because it was in the service of the American people. Barr responded with a jaw-dropping “defense” by claiming that he wasn’t obligated to look at what was best for the nation, or even use his best legal judgement, but that so long as there was any way to view Trump’s demands as “reasonable” he had to follow them. Treasury Secretary Steven Mnuchin acknowledged Tuesday that the agency’s lawyers have been in contact with the White House about an official congressional request for six years of President Donald Trump’s tax returns. Mnuchin, however, said that he had not personally spoken to Trump or to anyone at the White House about the request. Later Tuesday, during a second round of testimony before the Financial Services Committee, he was asked by the panel’s chair, Rep. Maxine Waters, D-Calif., if he’d comply with congressional requests for the Trump returns even if it meant he could be fired by the president for doing so. “As I said before, we will follow the law,” he said.